Tensions are always fraught between North and South Korea. Now hackers on both sides of the border could be inflaming the situation further with a series of online attacks. The Guardian reports on a group of South Korean hackers who recently hijacked the official North Korean Twitter account, YouTube account and website. The group posted messages criticising the North’s leader, Kim Jong-il, and his son, Kim Jong-un, who is widely believed to be lined up as the communist state’s next premier. Tweets posted by the hackers reportedly included a call to “point guns towards traitor Kim Jong-il wasting fortunes on nuclear and missile weapons instead of feeding his people” and “Let’s create a new world by driving out rebels Kim Jong-il and his son Kim Jong-un!” Then on Saturday, the group accessed the North Korean YouTube account to publish a satirical animation criticising the regime to the soundtrack of Nintendo’s Super Mario World. 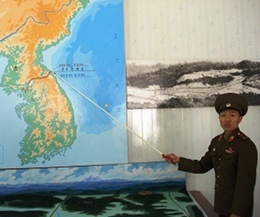 The skirmishes come at a time when North Korea has been calling for fresh talks to ease tensions between the two states. South Korea has rejected these calls however.